“It was Virgil who first found the way to my heart and opened my budding imagination, by speaking to me of the epic passions for which instinct had prepared me,” wrote Hector Berlioz (1803-1869), recalling his reluctant childhood studies of classics (Memoirs, trans. Cairns, 35). Once kindled, his enthusiasm for Vergil was life-long, and at the urging of Princess Carolyne Sayn-Wittgenstein, Berlioz began work in 1856 on an opera based on the second and fourth books of the Aeneid. 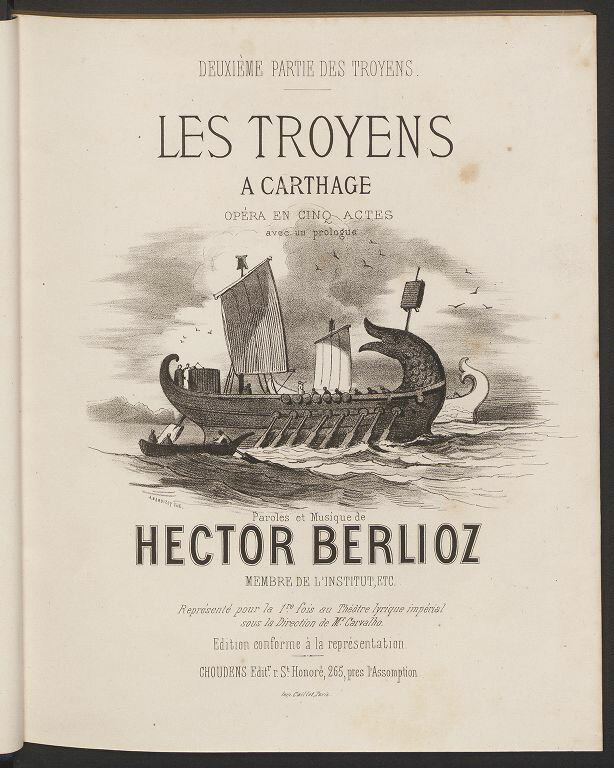 Berlioz conceived Les Troyens as one opera, but was forced to divide it into two parts for performance at the Théâtre-Lyrique when the Paris Opéra refused the work after years of delay (vividly recounted in his correspondence). As noted in the front matter of the vocal score, a full production without cuts would take 206 minutes to perform; with 15-minute intermissions, a 7:30 curtain meant the opera would finish 4 minutes before midnight, not allowing for applause and curtain calls (with substantial cuts, the run time could be reduced to a less daunting 140 minutes, or about 3 hours, 45 minutes total). Acts III-V, heavily cut and revised, premiered as Les Troyens à Carthage on November 4, 1863. 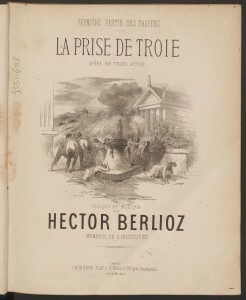 La Prise de Troie (originally Acts I-II of Les Troyens) was not performed during Berlioz’s lifetime, and a staged production premiered only in 1890. The five-act Les Troyens was not staged until the 20th century, and an uncut version not until the centenary of Berlioz’s death in 1969. In addition to autograph and copyist manuscripts, the original version of Les Troyens survives in a few proof and presentation scores dating to the early 1860s. Antoine Choudens published vocal scores of La Prise de Troie and Les Troyens in 1863, and in 1889 reassembled a complete Les Troyens from the plates engraved for those editions. 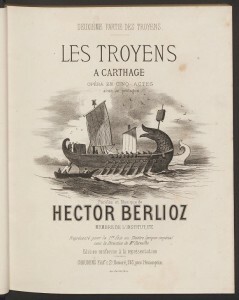 Choudens’ numerous issues of Les Troyens à Carthage reflect the cuts and revisions made under Léon Carvalho’s direction for the Théâtre-Lyrique, a trial that Berlioz described with unconcealed disgust: “But oh, the agony of seeing a work of this kind laid out for sale with the scars of the publisher’s surgery upon it! A score lying dismembered in the window of a music shop like the carcass of a calf on a butcher’s stall, and pieces cut off and sold like lights for the concierge’s cat!” (Memoirs 491). Les Troyens : La Prise de Troie, 1er et 2e actes : Les Troyens à Carthage, 3e, 4e, et 5e actes. Paris: Choudens Fils, [1889?]. 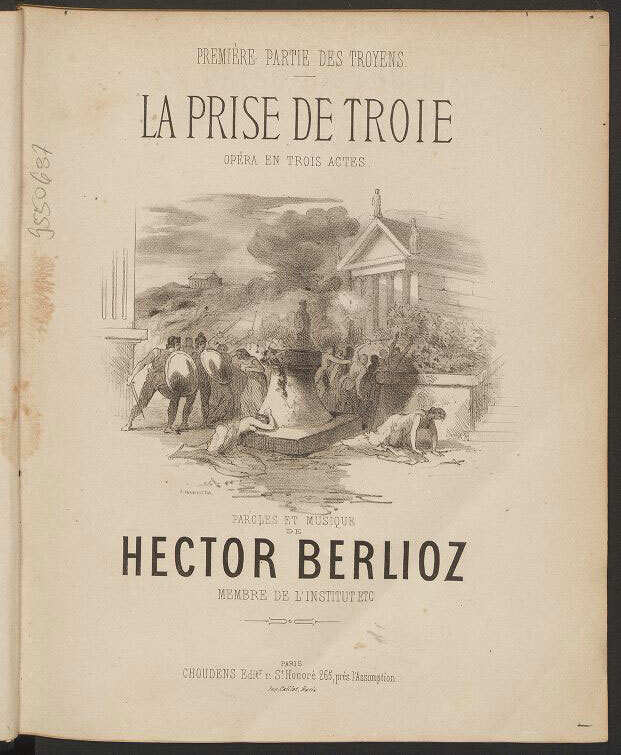 La prise de Troie : opéra en trois actes / paroles et musique de Hector Berlioz. Paris : Choudens, [1864?]. Les Troyens à Carthage : opéra en cinq actes avec un prologue / paroles et musique de Hector Berlioz. [Paris] : Choudens, . Benvenuto Cellini, rejected by the Opéra-Comique, premiered at the Opéra in 1838 after a tumultuous rehearsal period. With the exception of the overture, the premiere was greeted by hissing of “exemplary precision and energy” (Memoirs 245). Never a huge success, the opera was subjected to extensive cuts and changes during its run; Franz Liszt’s Weimar revival in 1852 led to further changes, including a revision of the original two acts into three. Benvenuto Cellini : opéra en trois actes / de m.m. Léon de Wailly et Auguste Barbier ; musique de Hector Berlioz ; partition chant et piano. Paris: Choudens, . Béatrice et Bénédict‘s production history is comparatively simple: commissioned for the opening of the Theater der Stadt in Baden-Baden, the opera premiered August 9, 1862, with Berlioz conducting, and the vocal score was published in early 1863. Béatrice et Bénédict : opéra en deux actes / imité de Shakespeare ; paroles et musique de Hector Berlioz ; partition piano et chant. Paris : G. Brandus & S. Dufour, .